We’re all set to screen at the Alexandria Film Festival on Saturday, November 17 at 4:00 pm. If you’re in the Washington DC area, don’t miss it! The theater is in the US Patent and Trademark Office at 600 Dulany Street, Alexandria, Virginia. 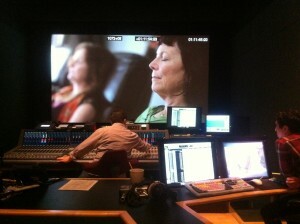 Today we finished our sound mix with the great Gary Rizzo. Composer Alexis Harte and I got to hear the soundtrack come alive in 5.1 Surround. 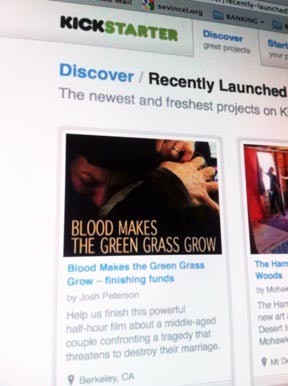 With color correction completed at ZAP Zoetrope Aubry Productions last week, there really isn’t anything left to do on Blood Makes the Green Grass Grow. We’re actually done! I’ve already submitted the unfinished version to a few festivals, and in the next weeks (and months…) I’ll be submitting to more, now with the completed version in all its sonic and pictorial glory. 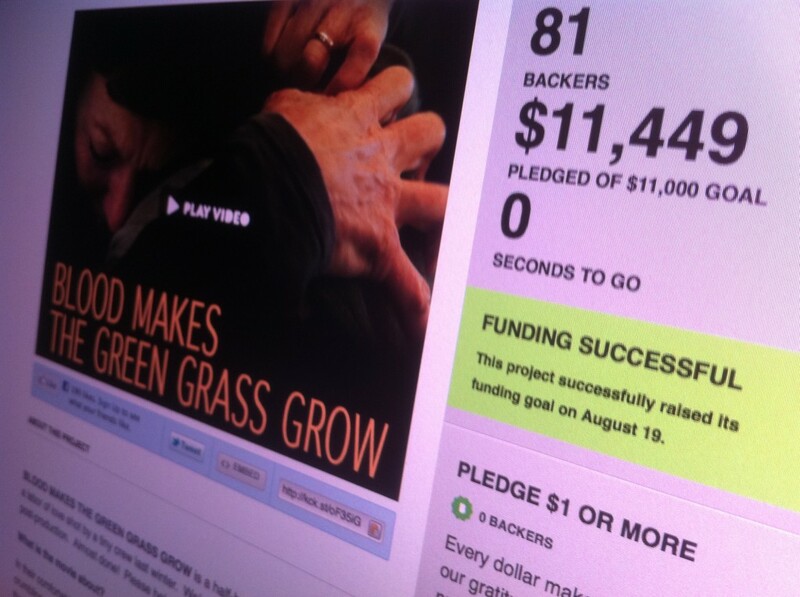 Yesterday we crossed the threshold (and even went a bit beyond our goal), making our Kickstarter campaign a success. Thanks to all who contributed and spread the word. Now it’s on to the home stretch. 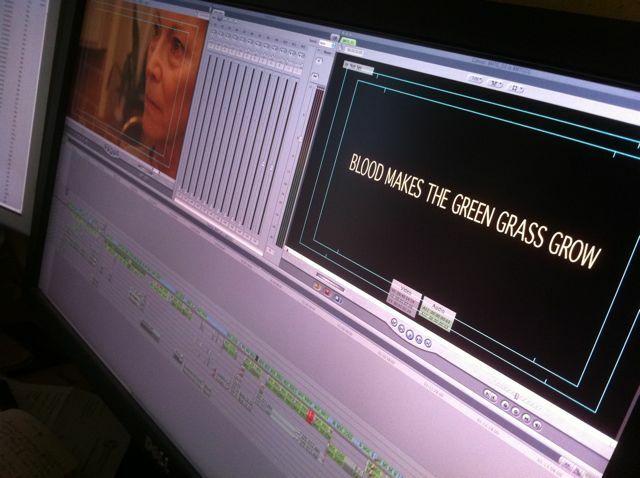 I’ve already met with the composer and sound editor, and have set up a plan with the color-correction facility. Onwards! August 20, 2011 | Categories: Production Diary | Tags: "Blood", post | Comments Off on Goal Reached! Check out our teaser trailer and Kickstarter campaign here! It’s taken a while, fitting in the edit around various projects-for-hire, but I finished the first cut today at noon. I’ve stuck with assembling the movie as written for the most part, and now the trick will be to take a step back and see if there are any outside-the-box structural changes worth making. This will be a challenge, as I’m so deeply entrenched in the vision I’ve been elaborating since last September, when I began writing the screenplay. Lincoln and Cortney graciously took time during the Christmas/New Year week for some more pickups. Spent afternoon with Lincoln shooting suburban details in and around Belvedere, and got some great late-afternoon-light shots. 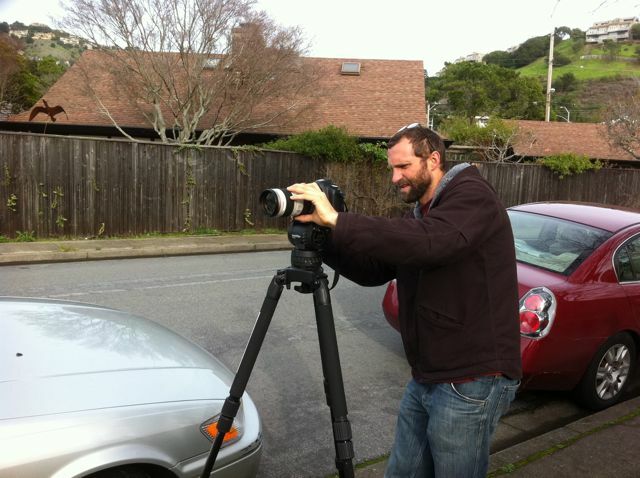 Then we met Cortney back at the scene of the crime, Betsy and John’s house, to get the opening shot of the movie, which meant me driving slowly up and down the street with Cortney shining a Dedo light out the car window (attached to a very long extension cord!) to get the perfect headlights-on-ceiling shot. After that we went upstairs to reshoot the dream sequence, this time hand-held. Lots of complicated lighting and elaborately choreographed shadow movement, so it took a few hours, but we got something great. Picked up Cathy at her place and drove to the station to meet the crew and extras for the bus scene. The first available bus had a wheelchair on it (right where the scene has to play) so we had to wait an additional 45 minutes for the next one. In the end it was a good thing, as it gave us some more prep time and delayed us until the Bay Area morning fog lifted and revealed the sun, which looked gorgeous streaming and flickering through the bus on our first takes. We did two full runs and two partial ones. The drivers and the very few real passengers took our presence in stride, and one driver even let us keep shooting during his layover at the end of the line (we did the extreme close-up inserts there). Then on to Naveana Nail Salon, which felt like a cinch after the anxieties of stealing the bus scene. Lincoln suggested swapping the planned shooting order, so we did all the dialogue first and the pedicure closeups last, which was much better for light but meant the actors had less help getting into the deeply relaxed state necessary for the scene, which they managed just fine with a few extra takes. Wrapped at 5:30, then loaded out and took everyone to dinner at Britt Marie’s down the street. Good fun. Then drove to SF and returned Bob Elfstrom’s lights and equipment (what would we have done without him?) and finally home, not too late. That’s 95% of the movie in the can – just a handful of inserts and pickup shots to grab when we can over the next couple of weeks. Back in the saddle for a skeleton-crew day. Met Lincoln in Walnut Creek midday and shot the park scene near Don’s house, then a bunch of moody twilight shots on his street. After sunset, we reshot scene 25 with Don in the car. Great work from Don and Lincoln, as always. Home in time for dinner! Beautiful morning, though cooler. Finished up the Bernsen photo compositing and drove up to Belvedere with Cathy again. Closet scenes in the morning, with Betsy and John’s walk-in closet working perfectly as the much smaller Bernsen closet. Lincoln ingeniously wired the lights to work off the actual switch. Then we ran upstairs to shoot scene 8 (Tom and Mary arguing about the car) and wrapped Don for the week. Diane showed up in a fantastically colorful “Vanessa” outfit and we shot scene 16, where Mary greets her at the front door. Diane ad-libbed some priceless lines and business, and it brought out the best in Cathy – we got some beautiful reaction shots from her, too. 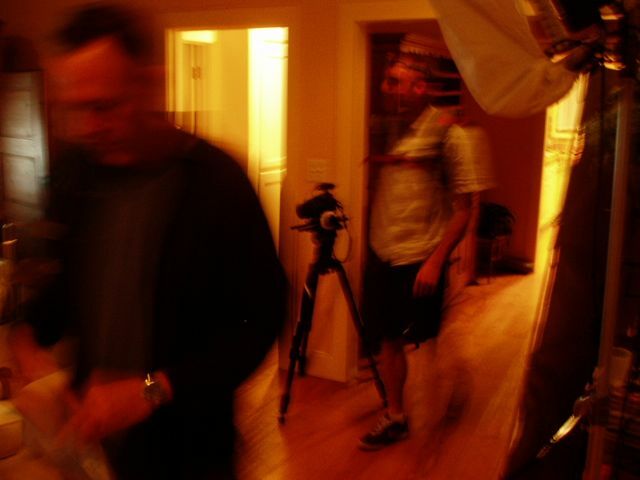 Wrapped the actors, then went back upstairs for the after-dark dream sequence. Couldn’t get the shot I had envisioned to work, but Lincoln had some nice ideas, and came up with a brilliant poor-man’s dolly, dragging a weighted tripod on a furniture blanket down the hall. Poor Man's Dolly – don't try this at home! We were pressed for time when we got back down to the bedroom for the scene 1 shots – Betsy and John were due to return home any minute – but Lincoln rose to the occasion and we raced through the setups as Cortney and the PA’s cleared and reset the upstairs of the house. We were on our way out as Betsy and John arrived, and it looked as if we had never been there. And so we wrapped our main location and our first week of shooting. More Photoshop work on the photos in the morning, and printed out the fake bourbon labels my brother Nick designed for scene 27. Picked up Cathy (as I did yesterday) and we drove up to Belvedere for another day in Betsy and John’s beautiful house. Everybody’s been eating lunch and hanging out during downtime on their deck, looking out at the gorgeous view of the Belvedere marina and enjoying the warm weather. Almost like a vacation. We started out with all the bedroom scenes except for scene 1; first day-for-night, then the morning scenes. Cathy and Don are amazing together, and all the backstory improv work we’ve done seems to have really paid off – they are totally believable as a long-married couple. Then upstairs we went for the climactic series of scenes. Very intense and completely successful. We struggled a bit over how to do the final shot – I wanted to track back from Tom and Mary sitting at the table, but without a dolly (or the time to set it up) we were stuck. Luckily I thought of trying a shot from out on the deck, with them framed by the big dining room window, which worked great. A very successful day.